James Dyas Davidson: Macdonald Aisle or tomb. This is the private burial ground of the Macdonalds at Remicras. 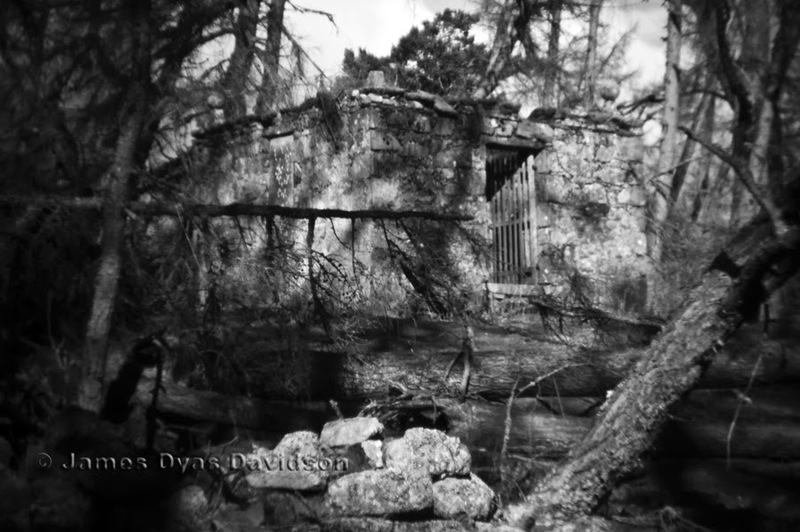 It is about half an acre in size, surrounded by a stone wall and one can see the remains of where an iron gate used to be. The Aisle is basically a square vault with two headstones. One states, ‘Within this tomb is laid the remains of Jas Macdonald Esq of Rineton who died on the 9th May 1776. Likewise of Helen Tulloch, his wife and several other Descendants.’ The inscription of a daughter of Helen and James, Christine, reads, ‘…wife of Lieut John Farquharson of 76th regiment…she departed this life on 29th August 1781, in the 49th year of her age, leaving one son and one daughter. The stone is erected by her son, Colonel Farquharson of the 25th Regiment.’ The stone was erected sometime between 1814 and 1817. A right in perpetuity was granted to the Macdonalds for their burial ground on payment of a nominal feu duty of one and a half pence (old money) per annum. It was not an easy place to photograph. I liked the decayed, dead, fallen and abandoned look of this shot, as well as the only blink of sun I got on the Aisle. I decided to try the cheap plastic Holga lens on my D50 and I'm happier with this image than the ones with the other expensive lens.